A Choultry, Or Place Of Worship Carved Out Of The Rock of Tritchinopoly. bl.uk > Online Gallery Home	> Online exhibitions	> Asia, Pacific and Africa Collections	> A Choultry, Or Place Of Worship Carved Out Of The Rock of Tritchinopoly. Plate eight from '24 Views in Indostan by William Orme'. 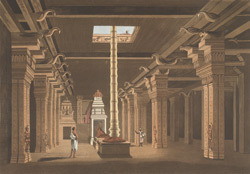 This aquatint of the Shiva temple inside the Rock Fort at Tiruchirappalli is based on a picture originally by Francis Swaine Ward (1736-94). To reach the temple, one has to climb hundreds of stairs carved into the rock. The pillar in the centre of the picture is made of solid brass, gilt and about fifty feet high. It supported various flags which are used as signals for prayers and can be seen for thirty miles across the surrounding countryside.